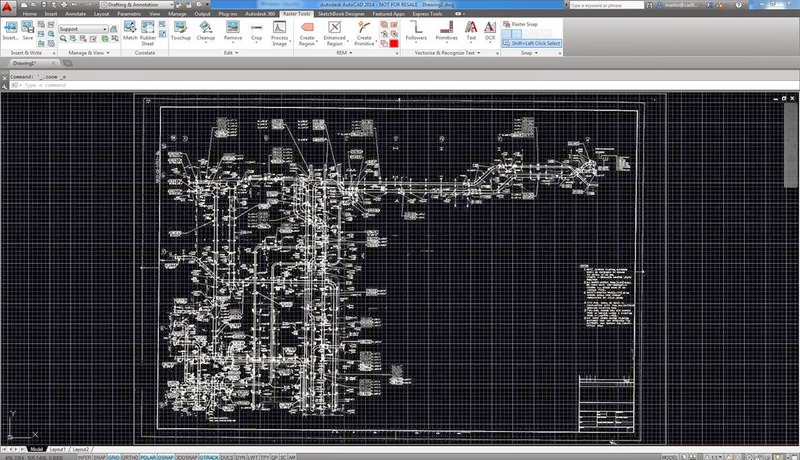 Over the some of the forthcoming blogs, I’m going to introduce a few of the features of AutoCAD Raster Design; I’m not covering all aspects as per a training course, but just giving some idea of the products functionality. This could possibly lead to the reuse of existing data such as scanned images of drawn components etc., and therefore reducing the need for redrawing. A scanned image may contain a number of faults which may be down to the scanning process, for example the original may have twisted during the scanning process or not placed squarely on the scanner bed. When inserted into a drawing the scanned image may be at a slight angle to the X axis this can be rectified by using the “DESKEW” command with in Raster Design. The alignment is not just limited to either the X or Y axis, but any line on the drawing which ever will give the best end results. In this example the alignment is with the X axis of the drawing. Once the “INSERT” command has been selected the “INSERT IMAGE” dialogue box is displayed. Bottom left of this dialogue shows three methods of inserting an image. “QUICK INSERT” – Inserts the image using the default values in the image header or by the values set in the AutoCAD Raster Design Options dialogue box. “INSERTION WIZARD” – Uses the wizard to guide the user through the image insertion process allowing the changes to made, prior to the raster image being inserted into the drawing. “INSERTION DIALOG” – Presents the same information as the “INSERTION WIZARD” but in a tabbed dialogue box. For this example I’m just going to use the “QUICK INSERT” option, but will look at the other two alternatives later. Also the “ZOOM TO IMAGE” check box is also ticked; this will quickly zoom to the image regardless of its insertion point. From the “LOOK IN” drop down list navigate to the stored location of the image file, select the required file and select “OPEN”, the image in now inserted into the drawing. When using the “QUICK INSERT” option it does not allow any changes to be made to correlation data which includes the insertion point, rotation and scale of the image. 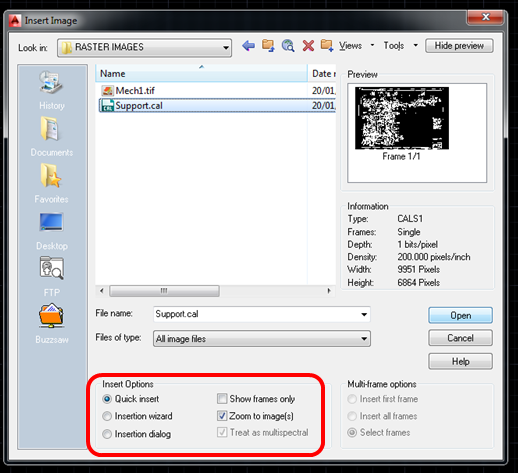 However defaults can be set via the “RASTER OPTIONS” dialogue box allowing multiple images to be inserted into the drawing file using the same settings. The image insertion point, scale and rotation may be changed after the image has been inserted. The image has now been inserted into the drawing, but from the scanning process the original drawing has not been placed squarely on the scanner, hence the image is at an angle. To correct this use the “DESKEW” tool, this is like using the rotate command but designed to work with raster instead of vector object and is located in the edit panel of the raster tools tab. Once selected the command requires a “BASE POINT” this point may be either at the corner of the image frame or in some cases on the image itself. After this point has been selected and if the angle of error is known, this may now be entered, alternatively two points may be selected on the image this is the source angle. 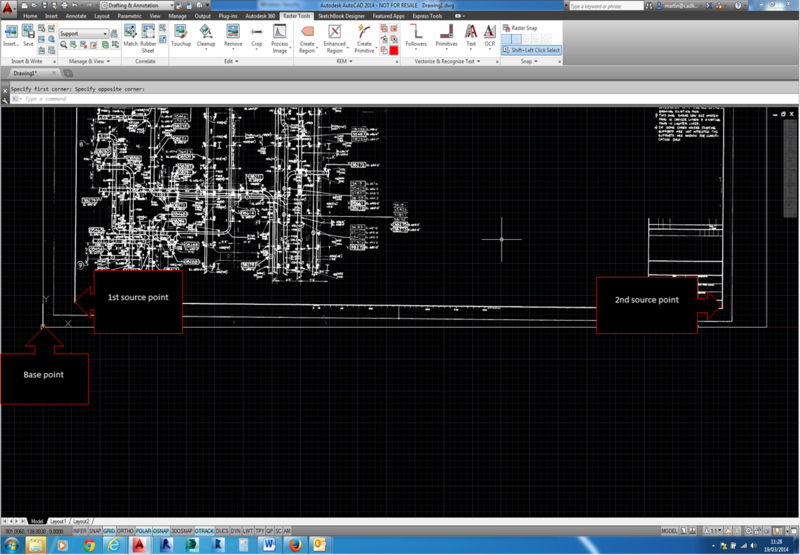 AutoCAD Raster Design calculates the angle between the two points and is displayed in the command line. The destination angle is now required, since in this case the error is along the horizontal the destination angle is zero.